Frencken J. E., Innes N. P. T, Schwendicke F. Managing Carious Lesions: Why Do We Need Consensus on Terminology and Clinical Recommendations on Carious Tissue Removal? Adv Dent Res. 2016;28(2):46-8. Innes NPT, Frencken JE, Bjørndal L, Maltz M, Manton DJ, Ricketts D, Van Landuyt K, Banerjee A, Campus G, Doméjean S, Fontana M, Leal S, Lo E, Machiulskiene V, Schulte A, Splieth C, Zandona A, Schwendicke F. Managing carious lesions: consensus recommendations on terminology. Adv Dent Res. 2016;28(2):49-57. Schwendicke F, Frencken JF, Bjørndal L, Maltz M, Manton DJ, Ricketts D, Van Landuyt K, Banerjee A, Campus G, Doméjean S, Fontana M, Leal S, Lo E, Machiulskiene V, Schulte A, Splieth C, Zandona AF, Innes NP. Managing carious lesions: consensus recommendations on carious tissue removal. Adv Dent Res. 2016;28(2):58-67. Handelman, S. L., Washburn, F., & Wopperer, P. Two-year report of sealant effect on bacteria in dental caries. J Am Dent Assoc., 1976;93(5):967–970. Bjørndal L, Larsen T, Thylstrup A. A clinical and microbiological study of deep carious lesions during stepwise excavation using long treatment intervals. Caries Res. 1997;31(6):411-417. Ricketts DN, Kidd EA, Innes N, Clarkson J. 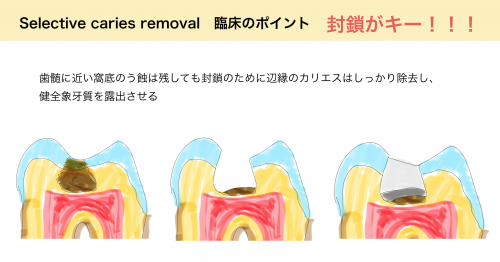 Complete or ultraconservative removal of decayed tissue in unfilled teeth. Cochrane Database Syst Rev. 2006;19(3):CD003808. Mertz-Fairhurst EJ, Curtis JW Jr, Ergle JW, Rueggeberg FA, Adair SM. Ultraconservative and cariostatic sealed restorations: results at year 10. J Am Dent Assoc. 1998;129(1):55-66. Schwendicke F, Dörfer CE, Paris S.Incomplete caries removal: a systematic review and meta-analysis. J Dent Res. 2013;92(4):306–314. MA Pereira et al.No additional benefit of using a calcium hydroxide liner during stepwise caries removal. J Am Dent Assoc. 2017;148(6):369–376.